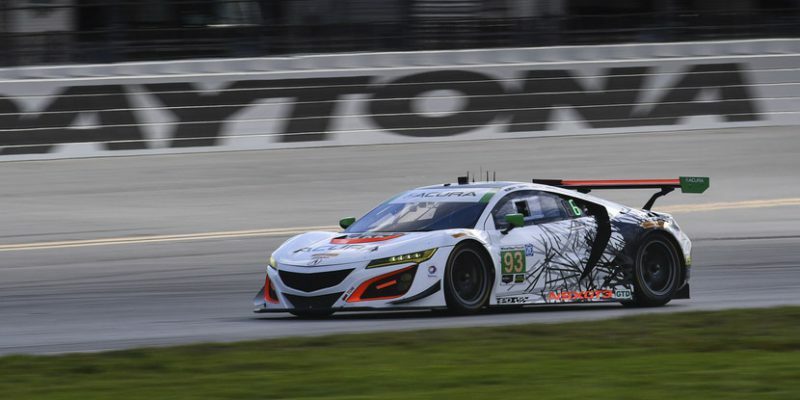 DAYTONA BEACH, Fla. – The Michael Shank Racing effort, led by drivers Andy Lally and Jeff Segal, posted top-10 runs in their Acura NSX GT3s during qualifying Thursday at Daytona International Speedway for this weekend’s Rolex 24, the opening round in the 2017 WeatherTech SportsCar Championship. Lally will start seventh in the competitive GTD field at this year’s Rolex 24, sharing his #93 NSX GT3 with co-drivers Katherine Legge, Graham Rahal and Mark Wilkins. Fellow veteran GT racer Segal will start his #86 NSX GT3 just behind his teammate, ninth in the two-by-two grid formation, while sharing driving duties during the 24-hour contest with Oswaldo “Ozz” Negri, Jr., Ryan-Hunter-Reay and Tom Dyer. The Acura NSX GT3s will compete in the GTD class of the sports car racing championship, campaigning against premium automotive brands including Aston Martin, Audi, BMW, Ferrari, Lamborghini, Lexus, Mercedes-Benz and Porsche. In all, there are 27 cars entered in the GTD field at Daytona, the largest of the four classes competing in the 24-hour endurance contest. Developed from the production Acura NSX, the NSX GT3 utilizes the production NSX’s ultra-rigid and lightweight multi-material body with aluminum-intensive space frame, which is produced at the Performance Manufacturing Center in Ohio, exclusive worldwide manufacturing facility for the NSX. The 3.5-liter racing engine uses the same design specifications as the production Acura NSX, including the block, heads, valve train, crankshaft, pistons and dry-sump lubrication system. A six-speed, sequential-shift racing gearbox delivers power to the rear wheels. The Acura NSX GT3 adds to a rich legacy of Acura sports car racing championships, including the 1991, 1992 and 1993 IMSA Camel Lights manufacturer and driver championships, and the 2009 American Le Mans Series manufacturer, driver and team championships in both the LMP1 and LMP2 classes. Video recaps from this weekend’s Acura WeatherTech SportsCar Championship activities at Daytona are being posted on the “Honda Racing/HPD” YouTube channel. Produced by the Carolinas Production Group, the video packages can be found in the 2017 HPD Trackside Video Playlist at: https://www.youtube.com/HondaRacingHPDTV.